This is similar to my stovetop recipe, decided to use the instantpot. Only changes I made was to add garlic and some thyme. Much faster using the pressure method. Soup turned out great. Taste the same as the slower stovetop method without as much attention. This will be the way I make the soup from now on, thanks. You can also substitute a smoked pork hock for the ham. So glad you liked it! And thanks for the tip about the ham hock- I’ll add it to the recipe card as an alternative. Yes, I made this in my 6 qt instant pot. You might want to cut the ingredients in half for your mini! Nice, simple. I always us a homemade broth made from smoked chicken/turkey. Even without the ham, they make a wonderful soup. Nice part about having a ham bone? – wonderful depth of flavor not available without it. I live at 4000 feet, and getting split peas to cook right – nigh on impossible. Yeah they get soft, but not creamy. Pressure cook is the way to go. So glad you liked it! Great tip about cooking at high altitudes with a pressure cooker, thanks! I made this soup for my father and I. It might have been the best soup I have ever made, it’s the second best at the very least. It was the best Split Pea Soup I have ever had. I will definitely be making this soup again. SO glad you liked it, and thanks so much for the comment! Thanks for Sharing this recipe, I plan to make it this week. Wondering if you think it would make a big difference to use a tablespoon of olive oil & some chicken broth to saute the veggies. I’m trying to make it a little more weight watcher friendly & would love to know your opinion. You can definitely use olive oil to sauté the veggies- that’s a great way to make this vegan compliant, too (omitting the ham bone as well as using veggie broth too, of course!). No need to add chicken broth to sauté the veggies. Just use the olive oil, and stir it around more frequently than you normally would so the veggies don’t burn and stick. The Instant Pot sauté setting is VERY hot, so just keep that in mind- you can always turn it off temporarily if it seems like the veggies are getting cooked too fast. Hope that helps, and hope you like it! Simple! Perfect! My parents lived through the depression and this is how they cooked. Few ingredients and making use of everything they had. Thank you for a wonderful recipe that goes back to the roots of cooking. So good! Didn’t have any celery so didn’t add it and it was still excellent! Great soup, but jeebus I hate having to spend minutes scrolling through life stories and crazy slow advertisements to get to the recipe. 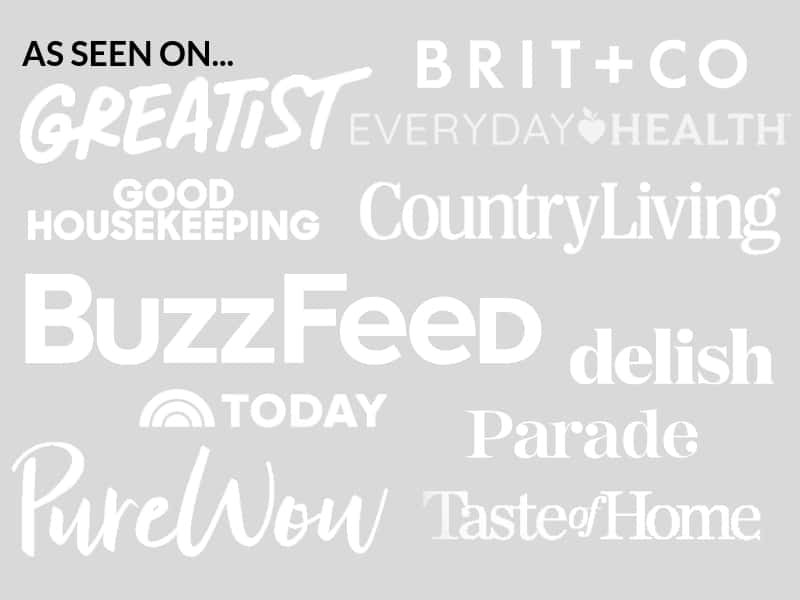 Maybe try recipe first, story/ads below that? Hey- I actually have a “jump to recipe” link at the top of the page. You can also press “print recipe” to just keep a print version of the recipe open in a new window. The text in the post doesn’t have “life stories” so much as it has information that is pertinent to the recipe- things that often come up when people leave questions in the comments. As for the advertising- providing free content online is what I do for my job, and I have to make money somehow! If you prefer recipes with no advertisements, cookbooks are always a good alternative to websites. Glad you liked the recipe! This is currently coming tompressure in my instapot now I can’t aait to try it fingers crossed my picky boys will eat it??‍♀️? hubs loves his moms version so I’m hoping this is better lol. I’ll update after plus I doubled it with my Xmas ham bone in my 8qrt so I can freeze a batch too. Hope you liked it! I’m considering an 8 qt. as well- I love cooking things in bulk and freezing them! This is the very first recipe I have made in my new Instapot, and it was delicious! No effort required, but all of the deliciousness achieved! Even my 16 month old granddaughter ate a bowl and loved it! We topped our bowls of soup with french fried onions, and it was spectacular. So is this recipe the French Canadian version? and… what are the differences? I have history in Midwest, Southwest and way north, British Columbia. Ham bones? anyone who lives near a ‘Honey Baked Ham’ can buy bones at their stores… I have them cut and keep in the freezer- just the two of us now so make less and in an enameled cast iron soup pot. I have been cooking long enough to tell this is a great recipe and close to my own. Like your blog and other recipes look good also. However this reached my mailbox… glad to have you here. Unfortunately I don’t know much about the differences of American and French Canadian split pea soup! Great tip on buying a bone from honey baked ham- I’ll have to try that next time! Great recipe, used a smoked turkey leg instead of the ham bone because I hate ham. Super delicious, whole family asked for more. 1. If I use a smoked ham hock instead of a ham bone, is the cooking time still the same? 2. Is there any benefit to soaking the dried peas before cooking? Cooking time should be the same for a ham hock! Soaking the peas before will cut down on cooking time and the amount of liquid needed, and it also helps break down some of the indigestible parts of beans (which are more prevalent in red beans, chickpeas, etc.). I haven’t found that it’s necessary with split peas, but I do it with other legumes. Hope that helps answer your question! Simple, easy, and delicious, Loved the result! I did the chicken stock version tonight, I think I’m gonna do the water version next. Thanks for the recipe! I want to try your recipe but my ham bone is frozen. Can I put it into the instant pot only for a longer time? What would you suggest? Also if I double the recipe do I double the liquid? Hi! You should be fine with a frozen ham bone. No need to adjust the cooking time. However, the colder it is when you turn it on, the longer it will take to come up to pressure, so just keep that in mind! As for doubling, my 6 qt. IP was pretty full when I made this. If you have an 8 qt, or if you make it on the stovetop, you may be able to double it, otherwise I’d keep the proportions as is. If you do double it, double everything except the ham bone. Hope that helps! 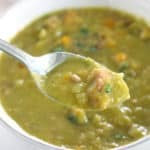 I’ve been making split pea soup for many years, one of my favorite! Now at age 73 I have found the ultimate recipe!!!!!! OMG! Even though I doubled the recipe, it turned out awesome. I had 2 bowls in a row which I never did before. I can’t say enough about it. THANKS SO MUCH FOR INTRODUCING ME TO YOUR VERSION. Hi. I just found this today since I’ve thawed out my ham bone from New Year’s Eve and want to make French Canadian Split Pea Soup in my Christmas gift (my new InstaPot)! I thought it was funny that I found it from an American site, as opposed to a Canadian site. LOL! I grew up in Canada (British Columbia is about 5000 km away from Quebec), but my very English-speaking Mom (not British, just a normal Anglophone from Manitoba) made this frequently, because it was healthy and inexpensive. She just bought a ham bone at the butcher, rather than the whole ham (which we only had once a year). But it sounds delicious! I can’t wait to eat it! I’ll post my thoughts on it after I’ve tried it, but I have no doubt it will be scrumptious! 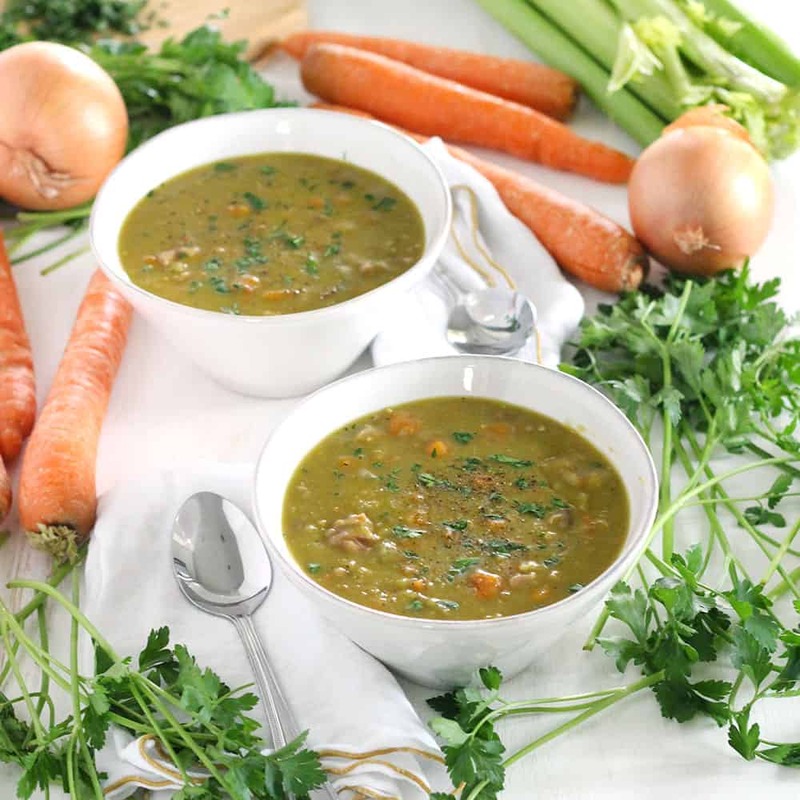 I have been married for almost 47 years and you can bet I have made plenty of split pea soup in my day — meaty versions, vegan versions, international versions. But this recipe is FABULOUS. I am new to the Instant Pot world, but am loving it — definitely not the pressure cooker I had as a young bride, which scared me to death whenever I used it. (I got rid of with the birth of our first child.) I cut the butter back a bit, added a diced parsnip and a bunch of chopped collard greens (because I never miss an opportunity to put greens in anything.) I skipped the salt (since I used chicken broth and ham) and used Aleppo pepper flakes instead of black. I let it cool naturally for 30 minutes and the texture was perfect. I will be snooping around on this site in the future for more ideas! Thanks! Oh yay! So glad you liked it! Love the idea of adding sneaky greens to it and Aleppo pepper. Thanks for the suggestions and the comment! Just made this with a left-over ham bone that had a lot of meat on it. Delicious! One change I would make: it you’re using a store-bought ham bone, cut out the extra salt altogether. There’s plenty of salt in the ham itself. Great tip-thanks! So glad you liked it! What is the processfor using an uncooked ham hock? Does it need to be precooked or does 15 minutes of pressure cooking do the trick? The one I am using is .7 pounds. Hm, good question! The ham hocks you buy at the store are almost always fully cooked / cured and smoked. If you’re sure yours is uncooked, I think it would probably be fine cooking for the 15 minutes of pressure cooking, especially since yours is so small. You can always try it out and check it when the time is up with a meat thermometer (or if the meat falls off the bone you know it’s done). If it isn’t cooked after the 15 minutes, you can add a little more time (if you don’t mind the split peas breaking down a little more). And if you’re worried about it, you could pre-cook it- it certainly won’t hurt! Hope that helps! I made this tonight and hubs and I loved it. I did have to cook it two more minutes to get the split peas all the way cooked. This could just be individual taste. I also added some fresh thyme since I had it. This will definitely be made again! Thanks. Thank you so much for the recipe – also love your comment about asking for the turkey carcass etc, that is me too ? ha ha. I was wondering – what is the serving size for the nutrition information ? Haha it’s WAY too good to throw away! Thank you for sharing this. I’m anxious to make it. Hmmm. It’s possible it overcooked from waiting to release the pressure, and it’s possible the ninja foodie cooks differently or faster than an Instant Pot. But also, split peas do kind of turn to mush! They break down a lot and the whole soup ends up being thick, almost like refried beans that have been mushed up. Sorry I can’t help you more! 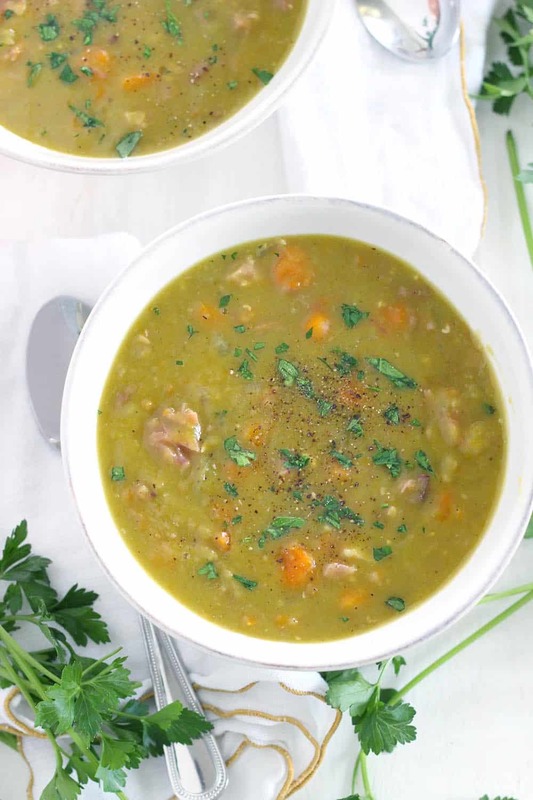 And the second Instant Pot of split pea soup is gone! I do cut the recipe in half since I have a 3 quart. I always have a couple ham steaks in the freezer…hmm..I think I see another batch of soup in the near future! So nice to make it without the long cooking times to get the peas soft and mushy. After it cools, I do add a little water; otherwise, it thickens so much in the refrigerator that its hard to get out of the container. That worked perfectly. Scoop it out, heat it up and chow down. My oldest son was here for Christmas. He ate multiple bowls..said it was a five star recipe. Lovely recipe! Would you please add a link at the top of your blog entries to skip to the recipe? Can I use leeks instead of onion? I think that would be DELICIOUS! I’d sauté them for a little longer so they really soften and get super tender. Hope that helps! Hm- I haven’t tried it frozen, but I think it would be fine! I think it will take longer for the IP to come up to pressure, so be prepared for that, but once it does I think the cooking time will be the same. Since ham is already cooked, you don’t have to worry about it being underdone. Hope you like it, and hope you enjoy your new Instant Pot! You can use frozen meat, definitely. My very first recipe in my IP was frozen chicken breasts and was for chicken enchilada soup. It was the most amazing, tender, and juicy chicken that I have ever experienced. As author mentioned, it just takes longer to pressurize and cook, but it’s still fast! It’s a rainy December day here so I’m making this with pieces of leftover Xmas ham. Thanks for the great recipe. Unfortunately I don’t own an official “Instant Pot” but I do have a brand w same settings. I use it 3-5x a week for everything from rice to pot roast. BTW do you have any similar black eyed peas & ham bone recipes for the IP? I’m looking for a New Years recipe w greens. Is it possible I can double the recipe with the same amount of ham or ham bone? If you double it I would recommend doing it on your stovetop since I don’t think it will fit in the instant pot! And yes you can use as much or as little ham as you want ? hope you like it! I just made this for the first time. I used the smoked ham bone left from Christmas and chunked up more ham. I have a 3 quart so I cut it in half. Oh man so so so good! We have maybe one bowl left! Something this good and this fast will become a staple. Just finished eating this delicious soup. My husband has been making this soup for over 40 years, he did not believe that I could make it so quickly and so well. Thanks so much. Directions were well written and easy to understand, only my 3rd time using the Instantpot. Will this recipe fit into a 3 quart Instant Pot? We are having ham for Christmas and I already bought the peas…can’t wait to try it. Hmmm I don’t think a 3 quart instant pot would quite fit everything! You could cut the ingredients in half (and still use a whole ham bone) and probably be fine, or you can do it on the stovetop or slow cooker. Hope that helps! I like this recipe and I am making it tomorrow, but I will be adding barley pearls. This gives the soup an interesting texture. Thanks for the recipe. Ooo I love the idea of adding barley! And I just happen to have some lying around in my pantry- I’ll have to try that next time! I’m going to try this tonight, as my second recipe in my new IP. I wonder if I can substitute a smoked ham shank for the ham bone, or will it be too smokey? The shank is cut into thirds, I could try it with one third and some thick cut ham steak cubes. Thanks for sharing the recipe! The ham bone I used was from a smoked ham so I think it would be fine! Hope you like it ? Thank you,thank you! This was my first real Instant Pot recipe (after experimenting with eggs and with brown rice) and it was incredible, both flavor and texture! I did add 2 T Sherry at the end – from my previous favorite recipe. The Instant Pot has produced wonderfully enhanced texture in all of things I’ve tried. I’m so happy you liked it! What a good suggestion to add sherry- I’ll have to try that. Sometimes I add red wine or apple cider vinegar at the end- delicious, too! This turned out so well! I’ve made snert many times, but this was my first in the Instant Pot. It was easy, delicious, and perfect, according to my Dutch palate. Agreed, and it’s so easy. I love how it allows the ingredients to speak for themselves, and it’s also amenable to a Tim Gunn approach: when what you have on hand isn’t exactly what’s called for, “Make it work”. I was short on butter so I did half and half with butter and olive oil. No ham bone handy, but in my local neighborhood smoked turkey is often used in place of the pork that my Muslim neighbors don’t eat. Two smoked turkey tails made a terrific substitute. Add in the Instant Pot and some day-before prep work, and you have a dead simple dinner on the table before you’ve had a chance to get home and catch up with the kids’ homework. 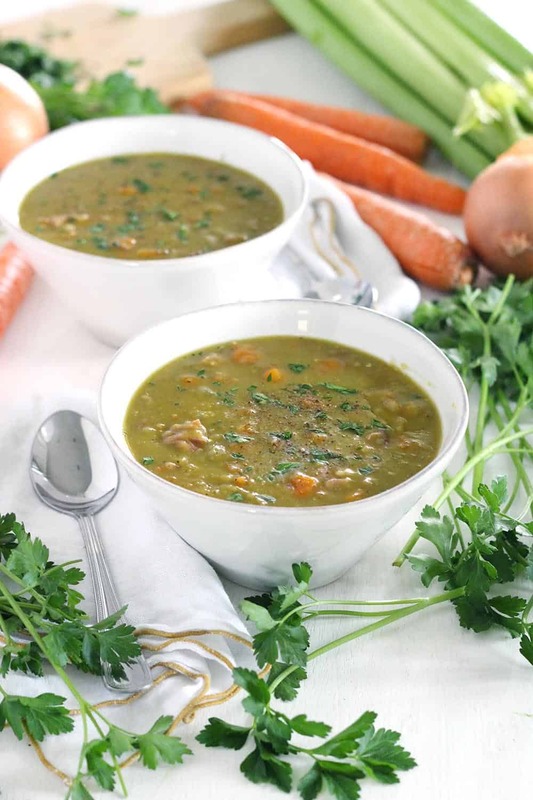 If you you’re dining on leftovers from a prior split-pea-soup meal, even sooner. We failed at leftovers this time, and there are only TWO of us! It Was That Good. Maybe next time we’ll grow some willpower. But this recipe is so good I hope we can be forgiven at least tonight’s gluttony. Hah! I’m SO happy you and your husband liked this so much! It’s one of my all-time favorites. So easy and so tasty! I love the consistency and the flavors- the ham is key! Glad you liked it, and thanks! I agree- the ham makes it! We loved it! Absolutely perfect! And I’m taking a couple of meals worth to my neighbor whose husband is in the hospital, and who is spending her days with him and not preparing meals at home. Makes a perfect comfort food for reheating at the end of a stressful and cold day. Aw I’m so happy you liked it, and I hope it brings comfort to your neighbor during this stressful time! Would replacing the chicken stock with ham stock make the ham flavor too strong? I’m not really an “exact” serving size person, but if I were to estimate, I’d say about 1.5 cups based on the fact that this recipe makes about 8 servings! Hope that helps. Is it ok to use a frozen ham bone? Should be fine! It might take a little longer for your instant pot to come to pressure, but I think it will work ? I have made this over and over again and it is consistently delicious. Simple and nutritious my family loves eating it often. So happy you and your family like it! Delicious! I made this recipe in my instant pot using smoked ham neck bones. Was perfect. My wife and I only have a 3 quart Instant Pot…Will this recipe work in a small pot? I have a 6 quart and it was pretty full… I would recommend cutting the ingredients in half. You can still use a whole ham bone or hock, if it will fit! Or just thick-sliced smoked ham without an actual bone is fine too. Hope that helps, and hope you like it! This recipe was excellent. I followed it exactly as it was presented. Very creamy texture and subtle in flavor. Thanks for sharing this with us.